The high temperature this afternoon will only peak at about 60 degrees around 2:00 p.m. and will drop into the 30s before Midnight. There is a scant chance of rain for late this afternoon so expect some cloud cover this evening with clearing skies later. The Grand March is set to begin at 7:00 p.m. from the gazebo at Veterans Memorial Park. (The rain plan would move the starting point to Vanceburg Christian Church.) Prom will begin at 8:00 p.m. at The Carter House. 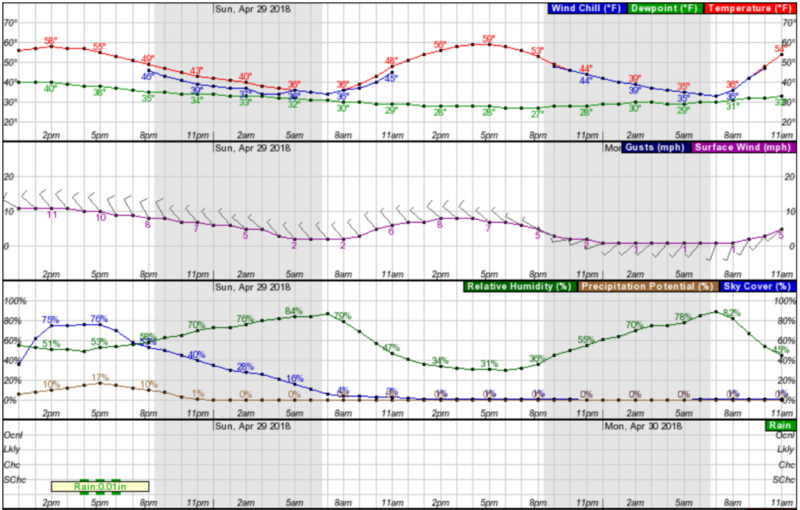 Relative humidity won’t exceed 70 percent until about 11:00 p.m. and west winds should be under 15 mph this afternoon. A couple of good coats of Aqua Net should keep things in place. Traffic in Downtown Vanceburg will be heavy late this afternoon and tonight. There will be street closures in the vicinity of The Carter House and Veterans Memorial Park. The street closures will be on Main Street, Front Street and Second Street. Several officers will be on duty to assist with the flow of traffic and parking. All motorists are urged to exercise caution on area roadways this afternoon and tonight as our young people participate in this event.